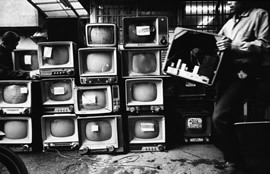 As newer models of televisions appeared, still useable older models simply were discarded. Photo from 1963. From the mid-1950s Japan entered a period of high economic growth based on a wide variety of industries. Some of the light industries in which Japan had developed major export markets in the prewar period quickly revived. Textiles, apparel, ceramics, and miscellaneous items such as watches and clocks regained their export markets quickly during this period. Small electric goods also were produced both for export and for domestic use. As the economy stabilized, Japanese consumers began to purchase more and more goods such as refrigerators, washing machines, electric fans, and transistor radios. By the 1960s, Japanese households were purchasing color television sets and family cars. The semi-annual bonus made it easier for households to plan and pay for for major purchases even though consumer credit plans such as loans and time payments were not available.